As promised yesterday, here is the first chunk of archaeological theory, social darwinism. Why do you need to know about social darwinism? Because it lies behind some very nasty ideology which was used to promote some hideous political actions which badly damaged thousands of people. Heard of the Stolen Generations? Seen Rabbit Proof Fence? Then you've come into contact with the impact of this idea. The clue is in the name with social darwinism. The central tenet is the application of Charles Darwin's ideas about natural selection to human societies. Darwin himself was far too busy molesting bumblebees and fearing for his mortal soul to develop and apply his ideas in a human context- it's slightly unfair that his name has been so firmly attached to this repellent theory. However, his key realisation: that animal species develop through evolution, changing in order to survive, came in the midst of a period of global upheaval caused by colonialism. European powers were tightening their grip on lands, resources and people they had acquired by conquest. Darwin's ideology, applied to humans, provided a neat ideological explanation for their success, and a reason to continue oppressing and mistreating colonial subjects. If some human societies are continually becoming more successful and developed (and the definition of that success and development is a 19th century European one), then others are left behind- and are doomed to go extinct. If you can't evolve, can't keep up- then it is not the problem of the people forcing you off your land, manipulating you into indentured labour, sexually abusing you. Nope- it's your problem. You didn't evolve into a developed enough society- so you're doomed to extinction. Sorry about that. Social darwinism provided a perfect, scientific excuse for colonial genocide. My favourite case study for understanding how warped and weird social darwinism is as an idea is one that's very close to home. The relationship between Britain and Ireland has always been a fraught one- from Strongbow (the Norman, not the cider) through Cromwell to Thatcher and the IRA. During the 19th century, Ireland was a British colony, and Irish people were some of the first victims of social darwinism in action. Irish people were portrayed in cartoons as stupid, ape-like louts. Their facial features were catalogued in phrenology textbooks as those of criminals. 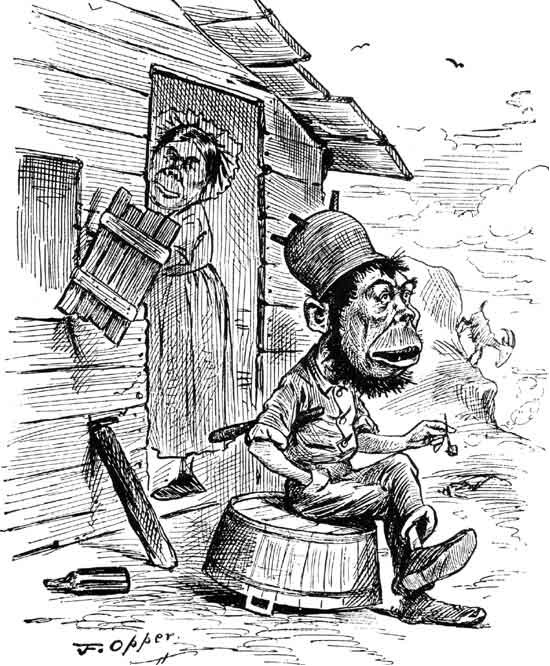 The Irish were compared to African slaves, as in this cartoon by Opper, which is titled "A King of Shanty," referencing the African "Ashanti." You can see how the Irish family are given flat, ape-like noses, prognathic snouts and hulking brow ridges, similar to contemporary racist caricatures of Africans and African-Americans. The man wears a pot for his hat, and sits on his arse smoking while his shoddily built house falls down around him. The empty bottle in the corner speaks volumes. So far, so unpleasant. Yet the deliberate portrayal of the Irish as stupid sub-humans doomed to extinction was closely allied to the devastation of the Irish population in the Great Hunger of the 1840s and early 1850s, and the continuing poverty and hunger which ravaged the population in the following years. Between 750,000 and one million people died in the Famine, and it's estimated that two million emigrated. In the light of later social darwinist ideas, this unimaginable suffering was a natural outcome of the racial inferiority of the Irish people- there was no need for soul-searching or guilt, still less compensation and assistance for the survivors. The Irish had failed to evolve a survival strategy for the modern world- it was only right that they face the consequences of their idiocy. It's a chilling example, and you can see already where social darwinism could and did lead- through a gate with Arbeit Macht Frei emblazoned on it. Racism and colonial economic interests backed up by science. The effects were long lasting, too- when my grandparents came to England from Ireland they were still faced with "No Dogs, No Blacks, No Irish" signs in boarding houses. The shadow of the stupid Paddy can still be found in Irishman, Englishman, Scotsman jokes. But how does this relate to archaeology? Isn't this just colonial history? The answer is a big, fat, NO. Firstly, archaeology was becoming professionalised at the same time as social darwinist ideas were popular: huge great tracts of early work are coloured by this theory. If you want to understand approaches to prehistory in particular during this period, you need to know how social evolutionism works as an idea. Richard Miles, in the last of his excellent series, covered this in a discussion of the interaction between social darwinism and nationalism in archaeology through the dual case studies of Piltdown man and Nazi archaeology. You can find it here. Secondly, Social darwinism is hiding behind archaeological interpretation all the time- particularly in popular media. Remember a few months ago I wrote a post about the infant remains at Poggio Civitate and the way they were covered. The assumption behind the pontificating in the Mail (amongst other offending media sources) was that the modern world is far more civilised, far better, far nicer than that of the past, and that we are currently the pinnacle of social evolution. The discarding of an infant body in such a way, nay, the very practice of infanticide, would not happen in our evolved world! Except it did. Horrifically, as in the Kermit Gosnell case. In another recent news story, there was some shock about the discovery of evidence for cannibalism amongst early European settlers in the New World. The scandal came from the provision of concrete evidence that the social evolutionary assumption that cannibalism is for savage, undeveloped headhunters, not recognisable early modern salt-of-the-earth pilgrims was proven to be false. The same racist assumptions of social evolutionary thought lie behind all the conspiracy theories about Mayan or Egyptian pyramids being built by aliens- because obviously (native) ancient people weren't developed enough to create such complex structures. Every time someone makes an argument about the past which relies on assumptions about inherent, continuous and universal standards of development, particularly when that development is based on morality, they are using the theory of social darwinism. I really hope, if you've read your way through this post, that you'll call them on it. It feels a bit disingenous to start a series on archaeological theory on a theory I'd hope you won't go on and use. But it's a chilling example of how strong and how long-lived an idea can be. Let me know your thoughts on this post, and I hope you won't just skip the next post in the theory season- I'll be talking about ethnocentrism and Levi-Strauss. I had this same talk with a guy in a coffee shop about the History Channel show Ancient Aliens. Wish I had read this first to provide a stronger argument but it got the job done.